If you can be in Taos in October, who needs a specific reason to be there? 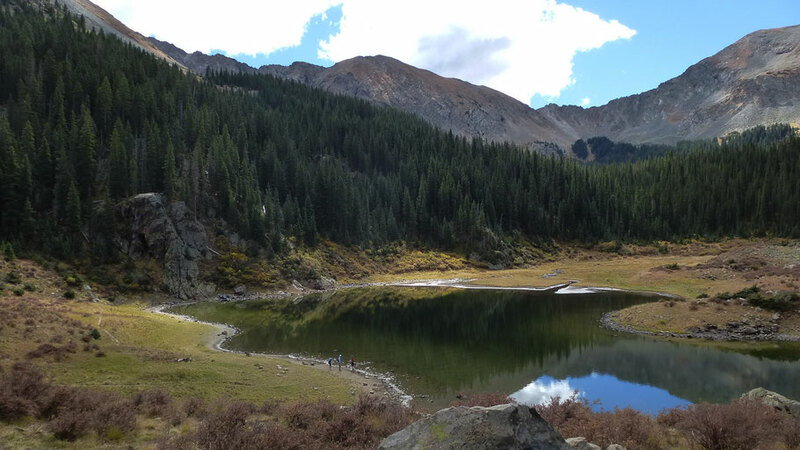 Here's one anyway: a hike that starts at Taos Ski Valley and ends at a lake below Wheeler Peak. You can see my YouTube video of the hike here. The hike to Williams Lake is 3.8 miles round trip and can be done in half a day. The trail is rocky and, on the way in, a steady uphill climb. There's no water along most of the trail so bring your own. If you do drink the water you find, be sure to purify it. When I did this hike (October 2, 2016) the aspens were at their peak and the Ski Valley was a pot of gold, making the drive in a delight. The Williams Lake hike took me away from those aspens but it's a lovely trail, and popular with both people and their dogs. I chose the trail so I could do one of my rare solo hikes. I knew that if I got hurt, someone would come along in the next five minutes to ask what was wrong. To reach the trailhead, drive to Taos Ski Valley. Turn into the first parking lot to your left and stay left. Drive onto Twining road (dirt, but carefully graded) at 36 deg. 35.819 min. N, 105 deg. 27.018 min. W. Stay on the road as it heads up canyon, climbing and sometimes zigzagging through a residential area. Multiple signs will point you in the right direction. Just after one sharp bend to the left, at 36 deg. 34.773 min. N, 105 deg. 26.422 min. W, turn right into the trailhead parking lot. As you begin walking you'll pass through private land, so stay on the trail (actually a road). Pass the Bavarian Inn on your left, then bear left so that you pass the Kachina chairlift on your right. Having a Bavarian style bar and restaurant so close to the trailhead could make for an interesting end to the hike, but in the fall the Inn wasn't open for business. A gray jay on the sign where the road ends. From here the lake is actually less than 2 miles away. At 36 deg. 34.283 min. N, 105 deg. 26.128 min. W, the road (such as it is) ends and there's a sign to let you know which trail you're on. When I paused to photograph the sign, I was practically mugged by gray jays. (Take some unsalted peanuts for them and also for any chipmunks and marmots you meet.) For a long time the trail climbs under evergreens but near the high point of the hike you'll encounter open areas such as the one shown below. A large clearing along the upper part of the hike. Just before the high point on the Williams Lake Trail, a sign marks a side trail to the top of Wheeler Peak (the highest point in New Mexico). The sign is at 36 deg. 33.563 min. N, 105 deg. 25.891 min. W. I took that trail to Wheeler Peak In October 2017 and you can find my hike description here. The sign marking the route to Wheeler Peak. The high point on the hike lies just beyond. Once you reach the high point on the trail, it's a quick, easy drop to Williams Lake. You could turn around at the lake, but there's a small side trip worth taking (about 500 meters each way, as the crow flies). At 36 deg. 33.477 min. N, 105 deg. 25.830 min. W, a faint trail branches off to the right. The side trail takes you to a pretty spot in the trees where water tumbles down a slope. As you take the side trail, it branches. If you take the rightward branches you can still get to the waterfall, but only by scrambling over rocks like a marmot. Your better choice is to stay close to Williams Lake until you're past it, then follow the most obvious trail. If you head to 36 deg. 33.316 min. N, 105 deg. 25.796 min. W, you'll find yourself on the correct trail. (You can also visit the lake shore first, follow that around to the right, then head to the waypoint I just listed.) The falls are at 36 deg. 33.271 min. N, 105 deg. 25.891 min. 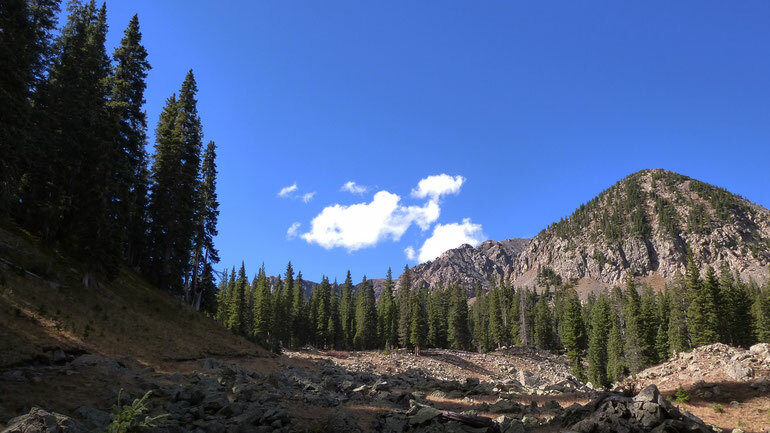 W.
During my hike I met a backpacker who took of the Bull of the Woods Trail from Taos Ski Valley to the top of Wheeler Peak, then dropped down the steep trail from the peak to the Williams Lake Trail. He then bivvied and was walking out as I headed up canyon in the morning. You could also do the loop the other way, but his loop put him near water at the end of the first day. Camping is prohibited within 300 feet of the lake or any streams. If I was to tent camp along this trail, I would dry camp at or near 36 deg. 33.518 min. N, 105 deg. 25.871 min. W, where there's a spot or two that should work for a two-person tent. This is not natural tent country, however; you'd be much better off hammock camping. One last comment. The valley contains multiple avalanche chutes, so a place to leave alone in the winter.